Both vegetarian and gluten free this flavorsome recipe from Waitrose makes the perfect dinner that will please all your guests. 1. For the curry base, heat the vegetable oil in a large frying pan and fry the onion over a medium heat for 10 minutes, until softened. Add the garlic, ginger and chilli and fry for another 10 minutes. Add the spices and salt and fry for 2-3 minutes, then add the passata and simmer for 30 minutes, stirring occasionally. 2. If you want a smoother consistency, whizz half of the sauce in a blender, then mix it back in with the rest. The sauce is now ready. Transfer to a freezer bag, cool completely, then freeze for up to 3 months. 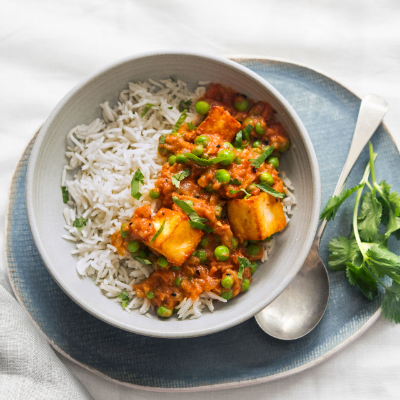 Or to prepare the pea and paneer curry immediately, leave half the sauce (about 500g) in the pan. 3. To finish the dish, add the peas to the curry base and heat gently, stirring occasionally. Heat the vegetable oil in a frying pan over a medium heat and fry the paneer on all sides, until golden. Lift from the oil with a slotted spoon and stir into the curry sauce. Fold in the yogurt, sprinkle with the coriander and serve with rice or naan, if liked.